Music can be not only distracting, but also detrimental to memory according to the study from Georgia Tech. Next time you lose your keys or forget what’s on the grocery list, you might be able to blame the soundtrack. A new study from Georgia Tech looks at the effect of music on memory and the difference between young and old brains. Music is everywhere, said Sarah Reaves, a graduate student at Georgia Tech, where she studies memory and aging. She wondered how music affects memory, like matching a face with a name. So Reaves gave a memory test to a group of young adults and a group of older people. Each person took the test in silence, and again with music they weren’t familiar with. “We knew that younger adults were going to perform pretty well, and older adults were going to be more shaky,” she said. That was just based on knowing that this was a kind of memory test that’s tougher for older folks. 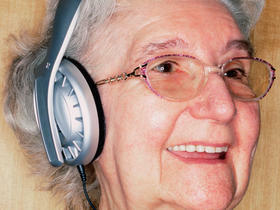 Music made it even worse for the older group; while there was no difference for the younger group. Reaves said the findings fit in with a body of research that indicates older brains have a hard time filtering out information. The findings have implications for improving memory, said Emory clinical neuropsychologist Felicia Goldstein, who wasn’t involved in the study. “It sounds pretty common sense, but we often don’t think about the importance of minimizing distraction,” Goldstein said. Another thing stood out to Reaves. The younger group did fine on the memory test with music on, but said that the music was distracting. If that’s the case, why do so many students do their homework with headphones on? “I just still want to know why young adults listen to music if they find it distracting,” Reaves said. The study was published in the journal, The Gerontologist.